Many factors go into making a particular destination a memorable place to visit. However, some vacations will outlast other trips in our memories. What makes a destination a good senior trip idea? Is it the location’s accessibility? The climate? Its historical attractions? The excitement it offers? Though one may be most important to you, each of these benefits contribute to the success of your destination as a tourist site. What better time to experience a magical place than when you’re retired! You’ll be able to travel at your pace and experience the myriad of elements that contribute to a memorable destination. 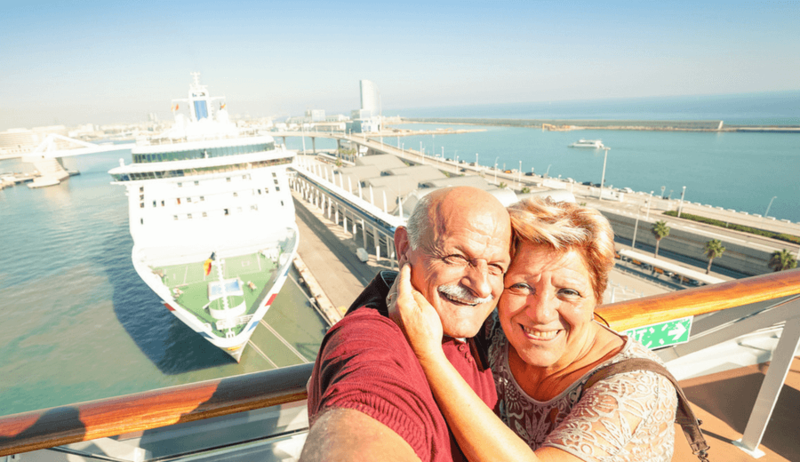 Here are some the essential qualities that make for a great, active senior trip destination. Having a direct flight, however long, certainly makes for a smoother journey. Flights with stops add to the probability of long lay overs which not only shorten your time to enjoy yourself at the destination, but also add to your tiredness upon arrival. If you can get your trip off to a good start, you’re in the makings for a fun and memorable experience. With this in mind, many destinations are improving their accessibility features. Take Australia, for example: Quantas Airlines is planning on introducing a non-stop flight from New York to Sydney by 2022. What is currently a 24 hour flight, typically accompanied by a layover, will soon be a direct flight that only takes 20 hours. With such these new advancements, the world will seem that much smaller, and many destinations will be more accessible. You are now at an age where you have the time and disposable income to travel when you wish and at your pace. 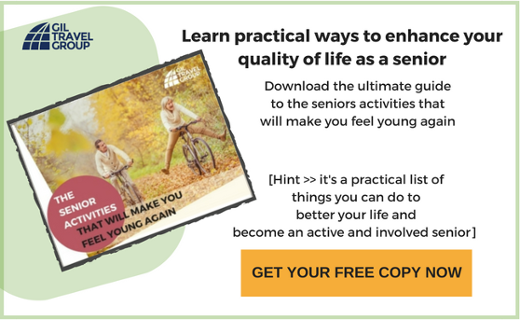 There is no reason to settle when you plan your travels as there are plenty of good senior trip ideas. It is always preferable to travel to the destination of your choice when the climate is temperate but not too hot. Why travel to Morocco in July or August with temperatures in the 90s when you can travel in March or April when the weather is beautiful and there is little rain? Why travel to Russia in the winter when you are guaranteed for snow almost every day? Wouldn’t it be better to travel the St. Petersburg during June when there are White Nights? There is plenty of information regarding the climate in different parts of the world, and it is best to consider your comfort when choosing your next travel destination. There are countless historically rich destinations throughout the world. Many may have been on your bucket list for years, and now is the time to see them. Whether you are a history buff or simply interested in different cultures, traveling to destinations with an abundance of historical and cultural sites will enrich your experience all around. Will your next destination be a castle in France that has turned into a historical museum? Or an excavated city like Jerusalem’s City of David with its rich biblical history? Or perhaps it could be the amazing city on top of Machu Picchu that uncovers the rich native culture of Peru? When you travel to such destinations, you are continually expanding your knowledge of the world. Traveling to a new destination where you have a personal connection offers a double reward, both thrilling and satisfying. You may even feel as though you’ve come home. Whether you’re traveling to see family or friends, knowing local people at your destination will allow you to see the place in a totally different way than going on a tour or with a private guide. Your family or friends can introduce you to others in your age bracket and who share your interests. This makes for a particularly good senior trip idea! It may even turn into a trip where you can find your roots - visit places that your family came from! Before you return home, not only will you enjoy your vacation, but you’ll strengthen your bond with your family and friends and even make some new friends along the way! Destinations that are great for families, friends, or retired couples make for a great senior trip ideas as well. Why not share these new and exciting memories with your loved ones? There are many destinations that are family-oriented, whether it be an all-inclusive resort in the Caribbean or a cruise around the Mediterranean or renting a Villa in Tuscany. There is abundant information not only about the sights that you will visit but also about the experience itself and doing some research will provide you with the insight to know whether it is right for you. If you get back from a trip and are longing for the food that you ate during the course of your trip, you likely had a meal that you will never forget! If you are a food buff, experiencing new cuisines for the first time is one of the most exciting aspects of traveling. Exploring a cuisine is a great way to learn about the cultural heritage of a people and area. Also, Culinary Tourism is usually very interactive and allows you to converse with locals you would normally not engage with.. For those looking for less strenuous trips with lower levels of physical activity, a culinary journey is a perfect way to see the world. How great would it be to expand your knowledge of the Mediterranean while expanding your food palate The best part is you may make new friends and pick up a new favorite recipe or two! Each new food will be a window into cultural heritage, and peering through cultural windows is another key in creating an unforgettable trip. Gaining insight into the lives of others makes for a rewarding experience and can even offer long-lasting connections! Secret Ingredients - What’s the Recipe?! Now that you know some of the secret ingredients for a good senior trip idea, what’s the recipe? How do you know where to go? Look back through the list and pick out the three that resonate with you most -- Are you curious about cuisine? Not a fan of the cold? Prefer to travel with a familiar group? -- and start there! Check accessibility and climate for your comfort: if long flights or hot weather are too strenuous, think about splitting up your journey, traveling somewhere closer, or going at a different time of year. Consider history, culture, and cuisine for your interests: if shards of artifacts are a bore, but architecture enthralls you, find a destination that meets your needs. If cultural immersion appeals to you more than a typical tourism experience, plan a trip that’s more off the beaten path. If you’d rather eat your way through your trip, consider what you love to eat! Think about your family and friends as traveling companions or destinations, and get double the rewards: get out while staying in your comfort zone by traveling with family or friends. Spend quality time while exploring someplace new. See a new location through loved ones’ eyes. Reflect on what matters to you most, and incorporate it into your destination decision. 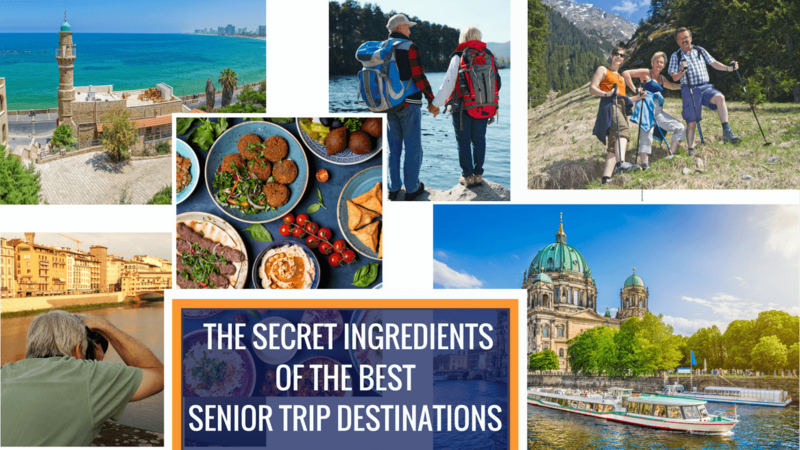 With all of these secret ingredients for an incredible trip, you’ll be able to plan the perfect senior trip personalized for YOU!